Tonight I attended the Calzone Kitchen event at Great Brickhill Cricket Club. The business formally known as the Cat’s Calzone; operating from Heath & Reach, now has regular eat in or takeaway gourmet events, every three or so weeks at Great Brickhill Cricket Club. I had been keen to try one of their hand crafted calzones for some time, having seen the social media hype and photos uploaded by friends. With this in mind, upon seeing the event scheduled for this evening I rounded up a couple of my work friends to give it a try with me. We clicked the website, chose our calzones and put in the fifteen minute time-slot we would come to collect – simple! Upon arrival, we parked easily at the Cricket Club and our order was already underway. Not wanting to give each other food envy, we all chose the original peri-peri calzone and placed a drinks order at the Cricket Club bar before collecting our made to order calzones in their takeaway boxes. We opened the takeaway box to find a pot of cracked black pepper and garlic mayo dip to accompany the calzone. The dough of the calzone was rolled into a long plait shape, containing their own signature tomato base, large succulent chicken pieces marinated in peri peri sauce with generous helpings of feta cheese, mozzarella, onions, basil, and peppers with a side serving of rocket. Thinly sliced chorizo was included and was just the right amount for me, though my friend found the thin cuts of chorizo slightly underwhelming, preferring a more spicier taste. Although, we discovered afterwards a spicier option is available for those fancying more of a kick to their calzones! Calzone is a notoriously filling dish, though the serving was just right, filling enough to satisfy most appetites but not too full that it made you feel you uncomfortable afterwards. Each dough is freshly made onsite for every event with each calzone individually handmade. The large chicken pieces had a succulent taste from the sweet tasting peri-peri marinade with the fresh basil really adding flavour to the calzone. The serving had the right amount of filling, unlike other calzones I’ve eaten, which have been lax on the filling and tasted too doughy. Generous helpings of feta and mozzarella cheese was included and an added bonus for a cheese lover like myself! 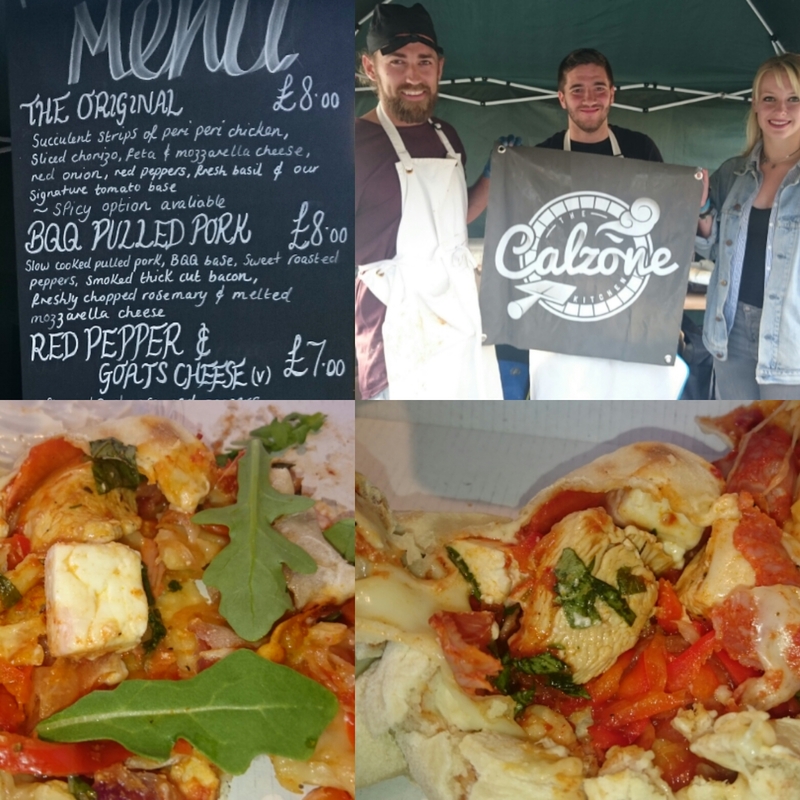 If you haven’t already tried it, keep an eye out for a similar event on the Calzone Kitchen Facebook page or check out their website here. The Cricket Club offers both indoor and outdoor seating and has a well stocked bar area for those choosing to eat in rather than takeaway. Events are scheduled around every three or so weeks with the company branching out for London events later in the year – so get in there quick!